Thinking Rock Community Arts, under the artistic direction of Robin Sutherland and administrator Miranda Bouchard, is back in 2017 to continue the collaboration with AlgomaTrad Staff and Campers on TRCA’s “Rivers Speak” Community Arts project. The collaboration was awarded an Artists and Community Collaboration Program (ACCP) grant from the Canada Council for the Arts in 2016. This year, with the help of James Stephens and other AlgomaTrad staff, more work will be done on developing a musical score for the project. This development will continue after Camp during rehearsals leading up to the production. As well, Production Designer Miranda Bouchard will be on hand with a Puppetmaking station – anyone wanting to help make puppets for the production is welcome to give a hand during Camp. 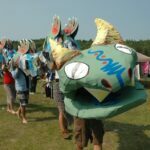 Members of the Jumblies Theatre organization will also be present to help TRCA and AlgomaTrad prepare for the upcoming production, which occurs September 6-9th and 13-16th, 6pm, at the Misswezhaging (Mississaugi FN) Pow Wow Grounds. If you want to know more about the “Rivers Speak” project, check out the link here.